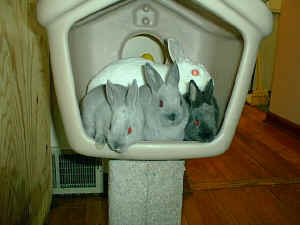 On August 22nd, 1999 I got a call from a girl who informed me her bunny had a baby an she didn't know what to do. She said there was only 1 baby and she didn't know when it was born since she only checked on the bunnies every 3 days or so. My husband and I went over saw the bunny's cage sitting up on top of their bar. I went around the bar and found 2 baby bunnies laying on the concrete floor (about 3 feet below the bar) that had managed to crawl out through the wire cage and fall off the bar. The babies were very cold and I was amazed to discover they were alive. The 4th baby was laying on the wire cage bottom with its little legs hanging through. I was infuriated at the situation since I had given the owners information on proper rabbit care and they had ignored everything. I took the mama and the babies and brought them home with me. 1 baby died that night of a broken back but the other 3 survived. I named the babies Precious, Hope and Treasure. 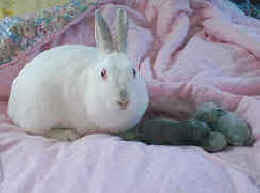 Hope, now called Beaker and Treasure got adopted and I decided to keep Precious. 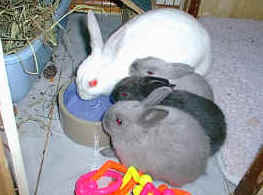 Snowflake was a wonderful Mama bunny and took great care of her babies. 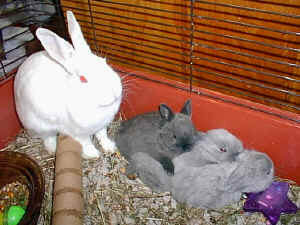 I always called her Mama Bunny since I have a bunny already named Snowflake and he is a boy. When Snowflakes babies were 7 weeks old, I decided it was time to get her spayed. The surgery went well and she was find when I brought her home. I checked on her incision twice and day and made sure she was eating and moving around. On 11/4/99, I noticed that she was sitting hunched in a very strange way and I took her out of her condo. Snowflake could barely stand and couldn't walk at all. I rushed and called the vet who was gone so I called the emergency vet. Within a few minutes, she seized a few times and then she was gone. The vet did a necropsy and it appeared that she had a sudden onset of viral pneumonia that caused lesions in her lungs and this was the cause of her death..
We miss you dear sweet Snowflake, may you romp in the gardens free from any pain at the rainbow bridge. We will remember you always.